In RapidDeploy templates are re-usable definitions or units of automation for a specific task. This could be a template for some infrastructure, an environment definition, some configuration, an application definition, etc. The most common type of template in RapidDeploy is a “Project Orchestration”. This is a template of tasks that can be created and modified to run on many target servers or environments. Right is an example Orchestration (or Template) to install IIS on a target windows machine. Technology templates are often created and distributed as part of a Plugin. So if you install the JBoss plugin, you will see the JBoss templates. In the image to the right we look at some examples that can be selected when a project is created. 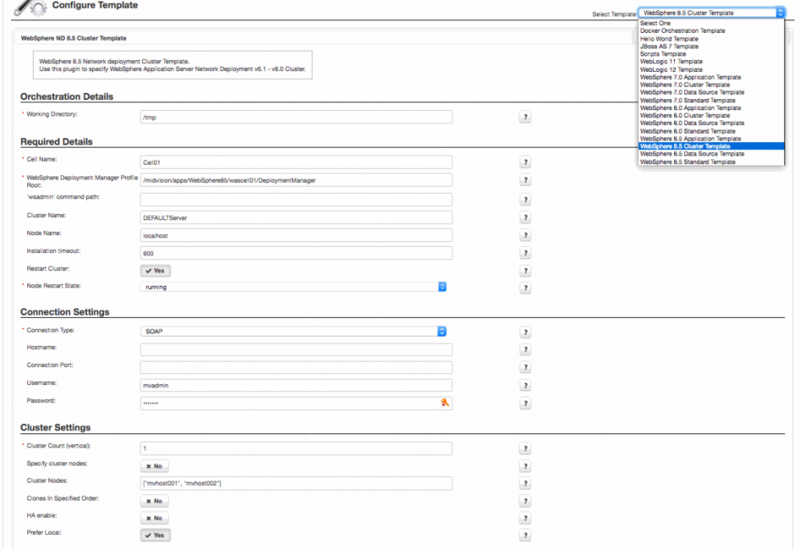 The example WebSphere Template actually scrolls well beyond the screenshot shown – you can configured dozens of items to, in this example, create a WebSphere Cluster. The templates ultimately are written to the file system as files – which themselves can be edited and written to one of the supported Source Control Systems. ServerName and ServerPort are used within the template to perform an action – and the @@SERVER_NAME@@ and @@SERVER_PORT@@ values are injected at deployment time to instantiate the template for a given environment. So target / environment needs a set of Data Dictionary values such as shown to be instantiated / provide the required value for the template. Everything in RapidDeploy is essentially versioned in the same way. A deployment archive is created – which contains the templates, configuration, orchestration, data dictionaries, etc. Everything we configure as part of the automation exists within the deployment archive – the left and right arrows under the actions column allow you to display and compare what has changed between the versions (including the Templates and Properties).